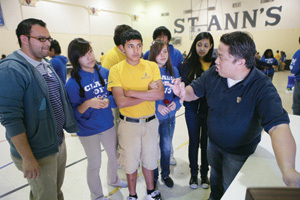 Richard Cardenas, Ph.D, far right, presents a physics experiment to local middle school students. Plenty of people can tell you about the work that St. Mary’s University Physics Professor Richard Cardenas, Ph.D., is doing on the campus and in the community. His dean is eager to talk about the prestigious award Cardenas recently received from the President of the United States for mentoring; his students are happy to talk about the transformational influence Cardenas has been on their college experience; and former students quickly recall their own positive interactions with the professor. Just don’t ask Cardenas to talk about these things. Once word came from the White House that he would be one of just 11 individuals honored with the Presidential Award for Excellence in Science, Mathematics and Engineering Mentoring, Cardenas became scarce. The more reporters called wanting to talk about his accomplishment, the harder he was to find. Finally tracked down weeks later for an interview with a local reporter, Cardenas admitted that while he was honored to be recognized, he was just not comfortable stepping into the spotlight. But, between his success in growing the St. Mary’s Physics Department and national recognition for his work preparing the next generation of scientists, Cardenas may have to get used to the attention. When Cardenas came to the St. Mary’s campus in 2000, there were only two students majoring in physics, most advanced physics classes had not been taught in years, and the degree plan on record was outdated. The next year, the degree program was revamped (it has since been updated again) and a biophysics option was introduced, quickly becoming a popular option among the growing number of physics majors. But where Cardenas has really stood out is in his work mentoring both local public school students and St. Mary’s students alike. For public school students, Cardenas is the energy behind Fiesta of Physics, a program he started in 2003 with a colleague as a way to spark interest in science while giving back to the community. It began as a one-time event, where hundreds of local elementary students were invited to campus to see fun and exciting science experiments performed by members of St. Mary’s Society of Physics. The program was so successful that Fiesta of Physics has become a traveling show as well, with numerous trips throughout the academic year to elementary and middle schools around San Antonio. During a Fiesta of Physics demonstration this spring at the KIPP Aspire Academy, a charter school focused on preparing inner-city students for college, Cardenas brought 10 St. Mary’s students to show about 90 eighth-graders that science can be fun. The visit came at the request of Emmanuel Barrera, a 2006 graduate of St. Mary’s, who is now teaching integrated physics and chemistry at the academy, and wanted to show his students what Fiesta of Physics offered. Since Fiesta of Physics began, thousands of local elementary, middle and high school students have participated. The visits include hands-on demonstrations of science principles, such as Newton’s third law of action and reaction (air is pumped into balloons before they are released, loudly squeaking and streaking across the gymnasium) and the effects of solidified carbon dioxide on a squishy blue racquet ball (it transforms into a solid rock, and shatters like glass when it hits the ground). Jessica Esquivel, a senior electrical engineering and applied physics major, has been volunteering with Fiesta of Physics since she was a freshman. She loves seeing the students’ eyes light up when they see something surprising happen in a science demo. “They can see that what they are learning in the classroom is real and that it matters,” Esquivel said. Cardenas is passionate about getting future college students interested in science, but he’s also passionate about mentoring current St. Mary’s students. He requires his physics majors to apply to at least four summer research programs, with the hopes that it will help them realize their own options. As a result, Cardenas has had many students accepted to programs at top-tier research schools, including Columbia University, the University of Notre Dame, and Texas A&M University. He understands the impact mentoring can make in a student’s life because he didn’t get that kind of push from his own college professors. “Because a significant percentage of St. Mary’s students are the first in their families to attend college, showing them all the options available is vital to their success,” Cardenas said.